Social media is one of the strongest marketing tools available to businesses around the world and, despite the occasional negative press surrounding platforms, has proven to be extremely popular with both brands and audiences, as well as a highly effective tool for companies. With an estimated, and ever-increasing, 3.2billion active social media users out there, businesses need to have a social media presence now more than ever, whether this is regularly putting out vlogs and video updates via YouTube, company updates and offers via Twitter or targeting audiences on Facebook. 3.2billion is a huge number to get your head around and when it comes to discussing social media, numbers can be easily underestimated. A great analogy is to consider the following: 1million seconds is equal to 11.5 days, while 1billion seconds is equal to a whopping 31.7 years. That’s a huge worldwide audience that your business is missing out on if you aren’t utilising social media effectively. Growing Awareness – If no one knows about your business and the types of products and services offered, they aren’t likely to choose you above your competitors. Social media presents you with billions of potential customers to market to, gradually growing brand awareness. Now, considering 95% of 18-34 year-olds on social media follow at least one brand, this is wasted potential when used ineffectively or not at all. 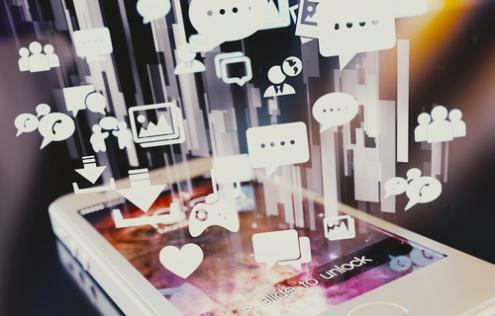 Meaningful Connections – Anyone can be marketed to on social media with the power of targeted advertising. However, social media users are growing increasingly impatient with promoted content popping up in their feeds and some even see it as intrusive. Potential customers want to see relationships forming between brands and their audiences, and social media is a good way to humanise your brand by regularly communicating with customers and creating a “brand voice” across all platforms. This brand voice is used to give your social media accounts some personality. It also helps your customers see that you’re more than just a corporate entity scouting for income; you’re a business building a family of patrons. Brand Loyalty – Brand loyalty is important and the key factor in retaining a returning customer base, helped by social media platforms that give businesses the tools they need for instant communication with their customers and potential customers. In addition to providing a digital notice board where customers can see company updates and upcoming offers, it allows for real-time problem solving for queries and complaints. Stay Relevant – In the modern digital world, information is constantly changing, whether it’s news updates from around the world, what’s going on with friends and family, or the latest offers from big brands. With social media going 24/7, it can be difficult to remain at the top of feeds and keep the attention of your customers, but social media makes staying relevant easy and allows you to be in constant communication with your followers. Be A Thought Leader – As mentioned before, social media users are becoming less patient with the constant barrage of advertising and marketing which is why it’s become even more important to establish your brand as a “thought leader”. Thought leaders are considered trusted sources of information in an industry and we see businesses moving away from constantly trying to sell, instead establishing themselves as informative accounts that are available to answer any questions from their followers and potential customers. Sharing relevant industry content, writing educational articles on industry updates and creating discussions around industry topics are great ways to begin launching your brand as a trusted authority. Every successful business needs to grow, as without growth there is no success. Social media can help with growth in a multitude of ways. Not just for building awareness around your brand, it’s also good for directing your customers to your website or store. Increasing Leads – You’ve got eyes on your brand, great! Now you need to start turning those views into potential leads and social media is your platform to do so. Its ease of use and built-in lead generating tools, including competition building, lead ad generation (Facebook, Instagram and LinkedIn) and social media listening options mean you don’t need to have a degree in digital marketing to run an effective campaign. Generating Web Traffic – “If you build it, they will come” – this Field of Dreams quote does hold some truth in today’s digital world. However, with an increasing 4billion active internet users and almost 2billion websites, that’s a lot for people to see! Generating web traffic can be difficult, especially if you all you are offering is your services or products. You need to have interesting or informative content that attracts customers to your website. Alternatively, you can use social media to drive customers to your site. For example, when posting a new blog piece, let your followers know and offer them a link to the new post. Similarly, when launching a new product, you can offer your followers a discount code and a link to the product launch page. Boosting Conversion Rates – When it comes to running a successful business, high conversion rates and completed sales are key. Social media means communication is always available, so customers who are on the edge of making a purchase decision can seek the help they need without having to look for the answers elsewhere. Not to mention, social media users will often post when they are looking for a service or product and with effective social media listening, businesses can use platforms to find these potential customers and reach out to them. Collaborate with Influencers – The younger generations of today are less likely to watch terrestrial television, instead, seeking their entertainment from online websites such as YouTube and watching things based on recommendations from their social media friends and followers. This change in platform has given rise to a group of individuals known as “influencers” or people who have grown popular on social media platforms and often recommend brands and products to their audiences. Businesses wanting to grow their awareness and customer base can easily collaborate with these influencers via social media and see a potential increase in conversions of up to four times that of standard social media marketing. Social media isn’t just about building awareness and growing conversions. It can also be an extremely useful tool for businesses looking to expand their workforce. Employing Staff – There are dedicated social media platforms for businesses, such as LinkedIn, that allow recruiters and HR admin to search potential employees for hire and this has proved to be effective for businesses in recent years. Not only can employers see how an employee handles themselves on a public platform, but social media has a much larger reach than standard hiring practices, allowing you to pick up staff that may not have used recruitment companies or job boards in the past. Employee Support – Not only is social media good for finding employees but it provides a platform for the brand to communicate publicly with its staff and considering word of mouth is some of the best advertising for a company, encouraging staff to talk about the business on social media can be advantageous and create a wider reach for potential customers. One of the greatest benefits social media can bring to a business is the always-on connection with customers. While phone lines and email accounts are usually closed with the office, social media provides another point of contact for customers to share feedback, ask questions or raise complaints. Real-Time Communication – Social media is an “in the now” communication platform that offers real-time communication between customers and brands, so customers don’t need to wait around on the phone or constantly check their inbox. Especially important, considering most people check their social media periodically throughout the day, so replies are often picked up faster. Customer Satisfaction – It’s important for brands that the relationships with their customers are positive and after an exchange of goods or services, businesses want to know their customers are happy. With social media being a communication platform where users share their daily activities, individuals are more likely to post about good or bad experiences they’ve had with businesses and brands. Widespread Connections – Social media has the ability to connect users from all around the globe, bringing people together from all walks of life. When you post on a public social media platform you are potentially opening up your feed to millions of views, so it’s important to consider the type of content you are posting and ensure that it isn’t likely to discriminate or cause offence. Managing a Crisis – Should anything go wrong and your customers are taking to the internet to issue angry complaints or log their concerns, using social media platforms allows your brand to react instantly. This is far more positive that waiting to send out a widespread email or make thousands of phone calls, which will mean increased resources and cost, meaning the required information may not always be available. A successful business is one that is constantly growing and developing, and social media can be an important part of evolving a business, making the communication platforms excellent for research and development. Learn More About Your Customers – When you start to grow your brand on social media, your follower numbers will gradually increase with potential or past customers. You can review your customers to find out general interests and the sort of things that attract their attention, enabling you to better target future campaigns to your audience. Collect Ideas From Your Audience – With increased social media growth you can start to engage with your audience more and find out if there is anything they think is lacking from your brand, whether it’s improved customer service, requests for certain products or adjustments to current goods and services. Customer feedback is made easier through good utilisation of social media platforms and through regular engagement with your followers. It can be a good platform to crowdsource ideas for business growth and development. Gauge Brand Response – Have you ever wondered what people thought of your business or brand? Or are you concerned about a new product or service rollout, as feedback hasn’t been sufficient? Social media makes gauging customer response and receptibility a lot easier, especially alongside managing social media listening and monitoring. If you are running a business, you are likely online with a branded website that details your products and services. You may also be posting regular content and advice for your customers to see and read, whether advising further information on a specific item or detailing the procedures of a certain service, social media can assist with your content and get it out to a larger audience. Promote Content – Unless you already have a large web customer base, when you post something new onto your website, it’s not likely to gain many views or it will do so slowly as your customers return to your website. Social media gives you the option to share content with your customers as soon as it’s posted, making a larger audience aware of the content, as well as adding a further search result for your content in search engines. Go Viral – With any content posted on social media, there is the potential for it to go viral. “Going viral” is the term given to a popular social media post that is picked up and shared by tens of thousands of social media users, with some posts being shared millions of times and receiving tens of millions of views. This is especially good for businesses and brands that see an instant uptake in the number of followers which can eventually be converted into customers. Finding Content – To stay relevant, businesses need to be producing regular content for their audiences and customers, which can be tricky after a while if you have been producing content for some years. Social media provides a wealth of resource for inspiration and you can also review what competitors are offering in terms of content, as you work to provide a similar level or better. Cost Effective – Posting and sharing content on social media is completely free and therefore extremely effective for strict marketing budgets, freeing up more spend for other important aspects such as hiring staff or growing the business. Posting advertisements on social media is more reasonable too when compared to traditional means of advertising such as magazines, newspapers or big outdoor posters and billboards. Targeted Advertising – If your business offers a localised service or the product has been designed with a specific group in mind (children, elderly, millennials, etc.) then targeted advertising is perfect for you. Targeted advertising offered through platforms like Twitter, Facebook and Instagram allows metrics to be set including age, location, gender, parental status, even adverts targeted to certain interest or hobby groups. This ensures that the people who see your adverts are relevant and offer an increased potential for conversions. Abandoned Carts – If you have a shopping platform on your website, you’ll be familiar with the concept of abandoned carts, where customers place the items they intend to buy in their online shopping cart but leave the website prior to checking out. Using retargeting adverts on social media platforms, you can ensure these customers see adverts featuring the items they have placed in their cart, acting as a reminder for them to go back and complete the sale. Improved Search Engine Ranking – Without relevant content for your business, your customers will have a harder time finding their way to your website via search engines. Through using social media, you increase your presence online and make it easier for potential customers to find you through search engine results. One of the best sources of information and content in any industry is your competitors, and with social media being a public platform, it allows you access to what your competitors are up to online. This means you can get a good idea of how effective their method of marketing and social media usage is and apply it to your own campaigns. Competitive Analysis – You can analyse a competitor’s social media feed to find out important information that can be beneficial to running your own social media campaigns. For instance, creating a comparison sheet and using 3 or 4 competitors, find out how often they post, what % of posts are promotional and how often they engage with commenters and their audience. You can even drill down into information such as their most used hashtags, their follower/following ratio and how often they post photos and videos. With this information in mind, you can use the gained data to build up your own social media feed with content that works to attract customers to your social platforms and website, but be mindful not to outright copy your competitors and instead use them as inspiration. Engaging with Competitor Audiences – There are many tools available for managing social media that makes it easier to collect data on posting trends and the types of conversations brands and their audiences are engaging in. Using these tools, you can create topic clouds to follow what’s being discussed and even join the conversation if there is something of value you can offer to audiences. When joining the conversation, you don’t want to be jumping the gun and trying to gain a sale. Instead, you want to provide insight and facts that add value to potential discussions regarding products and services relevant to your brand. Good conversational content will naturally lead to visitors finding their way to your social media feed and website, where your promotional content will be available for them to see. Efficient social media use is more than just putting out regular promotions and sales posts. It should instead be considered a source of information for your target audience, where you try to answer questions that customers might have about the industry and remember to network positively with your audience and other brands. Building a social media following can be slow going but it’s important to keep going, building your profile so you have a presence for potential customers to find and learn more about your company. Unless you are in a strictly formal or essential industry, social media should be enjoyable and can be a bit of fun for your company, and as long as posts are not going to cause offence or be discriminatory, it can be an anything goes platform where you can give your brand a more relatable personality.